With a couple of games under our belts from last weekend the 2019 club season has already begun. This weekend sees a few more players [six league games in all] don the whites and also some of the 1st XIs from the top divisions make an appearance in friendlies. Certainly the most interesting [and only] league fixture today is the clash in Division 10 between Clontarf 5 and Merrion 6 - both teams having being promoted from D11 last season. In 2018 Merrion 6 were one of the most successful team in the whole Open Competitions going through the league season without losing a match. But this is a higher division and anyway teams change from year to year so it will be interesting to see how they fare. Clontarf 5 have the advantage of an early outing, they played last weekend, but lost to DLR County 3. Clontarf field nine of the players who turned out for the 5th XI last season and will be looking to Rana Tariq, Muhammed Rizwan Ullah and Nigah Shah to provide the backbone of their batting. The issue may well be the bowling with none of the main wicket takers from last season involved. Jamie Champion makes his debut in Open Competitions and Abhinav Bargur [promoted from the 6th XI from last season] retains his place after his four wickets last weekend. Little can be learnt from last year’s form from a much changed Merrion 6th XI with only five players featuring from last year’s D11 winning side. Of these Merrion will be looking to Ravi Shokeen and Venkat Puli for wickets and Rishabh Sharma for runs. New this season are Himanshu Kamat, Vicky Dalwani, Kunal Kalra and Vikram Sharma. From last year Merrion will miss Sateender Pal Singh and Kamaldeep Gill who have both moved to play with Lucan. Apart from the welcome increase in the number of clubs there are perhaps two main points that arise from the Table. The first, a positive one, is the way that a number of clubs have pushed up the Divisions and are now bunched  between D4 and D8. The second, not so welcome, is the widening gap between these and the top three divisions. In 2016 there were 17 teams between D1-D3, today it is only 15. Whether this strengthens or weakens the case for the a possible league re-structuring that brings 1st XI teams together to drive better competition at D2 level I leave for others to debate. Overall, however, things seem to be moving in the right direction. 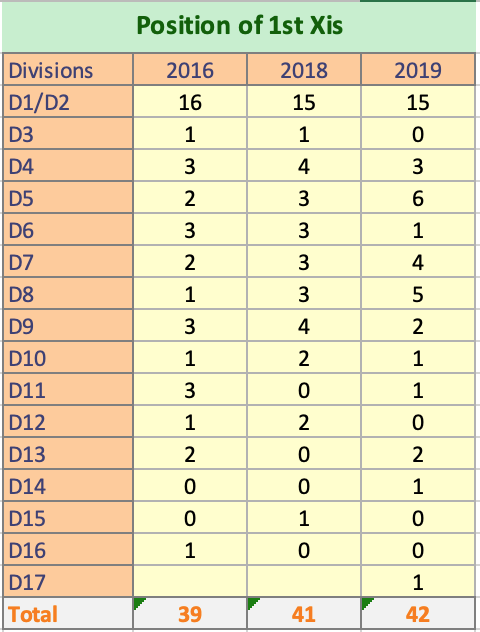 At the end of 2018, twice the number of clubs had secured promotion for their 1st XI  than suffered relegation. The key area to look at this year will be D4 to see how Laois, North Kildare and Longford fare against the 2nd XIs of Phoenix and The Hills and, perhaps more critically, the 3rd XIs of Merrion YMCA and Clontarf.